Dehumidifiers, Water Extraction Westborough | MA Restoration Inc. Installing a dehumidifier is very important in controlling the humidity in your home. Controlling the humidity levels in your home is key to protecting your home, health, and family. High humidity in your basement/home can cause the areas to smell, have poor air quality and produce mold growth. Mold grows fast in humid areas, your basement is an ideal area. By installing a dehumidifier in your basement you can stop the growth of mold and eliminate the unpleasant odors that are associated with mold growth. Unpleasant odors may be removed by decreasing and controlling the level of humidity in your basement. However, if mold is present it should be remediated properly first, then be assessed for a dehumidifier installation. M.A. Restoration supplies and installs residential dehumidifiers in our customer’s homes. M.A. Restoration recommends a Santa Fe Residential Dehumifier to reduce and control the level of humidity in your home. 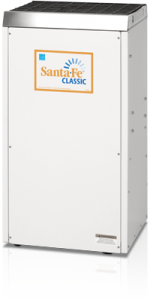 The Santa Fe line of high performance, energy-efficient dehumidifiers are designed to provide the ultimate in moisture control for residential basements, crawlspaces, and living spaces. Every Santa-Fe dehumidifier meets or exceeds the ENERGY STAR® program efficiency standards. Click here to visit the Therma Store website to learn more about the Sante Fe humidifiers.